I often get asked about colour choices for my stranded designs. Clearly choosing colour is not something that comes naturally to everybody, and indeed even those who are skilled at it are unconsciously observing a set of principles that govern whether colours will work well together or not. The wheel shows a spectrum of colours arranged in a circle. 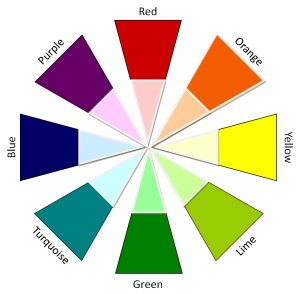 There are several types of colour wheel, some with colours arranged in different proportion to each other than I’ve shown here. This one is very basic to assist you with simple colour choices for stranded knits. The major principles to deal with in choosing colour for knitting are ‘complementary colour’, and ‘shade’. ‘Complementary’ colours are those that are fully opposite each other on the colour wheel; red and green, orange and turquoise, yellow and blue, lime and purple. Colour schemes combining these work very well. For example, I used turquoise and orange together for the main pattern sample for my Tess slippers. ‘Shade’ refers to the depth or saturation of a colour – light or dark. I’ve shown a deep shade and a light shade of each colour on my colour wheel to illustrate this. ‘Monochromatic’ colour schemes combine different ‘shades’ of one colour. For example, the main pattern sample for Pemberley is a monochromatic scheme, combining very dark and very light shades of a turquoise colour. ‘Complement’ and ‘shade’ can be used together for very effective colour schemes. The yarns I used for my Tess slippers were not only complements (turquoise and orange) they also had a significant level of shade contrast – a very dark orange (‘rust’ or ‘burnt orange’) combined with a very light turquoise (pale aqua). For multi-coloured knits, combining many colours, colour selection gets a little more complex. Here I prefer to stick with colour ‘families’. A colour family is a group of colours that are all close to each other in the colour wheel. If done carefully it is possible to successfully combine many different colours using varying shades of one colour family with varying shades of the complementary colour family (the colours that are close to each other on the opposite side of the colour wheel). This is what I did with Lissuin; the background colours are all in the yellow/green colour family, and the foreground colours are two red-purples. However, I was careful to grade the shades of the background colours so that they undulated from light to dark and back again, and from green to yellow and back again. Motifs do not show well on multi-coloured schemes using very randomly placed colour and shade. Many stranded knits are successful because instead of combining several colours from the wheel they combine a colour (or two complements, or a monochromatic scheme) with ‘neutral’ colours. ‘Neutrals’ are any shade of brown or grey (including white and black). If you do this remember to take shade contrast into consideration to ensure motifs stand out clearly. Finally, I know lots of knitters like to use variegated yarns. Alas, extreme care must be exercised when using such yarns for stranded knits. I recommend only using variegated yarn in combination with a solid yarn in a colour or neutral that does not appear at all in the variegated yarn, and where there is a significant contrast of shade (light and dark) between the two yarns. My example here is the Durmstrang socks, the background yarn is a light to medium green yarn with short lengths of pink, yellow, lime, and red-purple, whereas the foreground colour is black.